Ayan gets Gopadevi/Krishna and Baldevi/Balram on horse and tries to climb horse with them, but they stop and say what will people think if they see a great warrior riding horse with 2 girls. Ayan if he should walk then. They say yes. Baldevi thinks Ayan wanted to separate Radha and Krishna and himself is going to reunite them. In Barsana, Radha’s friends show her wedding gifts. Radha feels weird and runs towards door. Krishna gets down horse and walks towards Radha thinking Radha can sense his presence. Radha stands looking at Gopadevi and asks who is she. Ayan says she is Gopadevi and other girl is Baldevi. Krishna asks Radha to call him Gopa as her friends call him that. Kirthida asks why did he bring them here. Gopadevi says they don’t have any place to stay and were traveling when few goons tried to harm their dignity, but god sent brave warrior Ayan who saved them from goons and since they don’t have any relatives and no place to stay, kind hearted Ayan brought them here saying Barsana will support them. Ayan’s friend sees Baldev and falls for her. Ayan says he brought them here to help in marriage house. Vrishbhan says he did right as Barsana always supports refugees. Gopadevi asks who is he. Ayan says he is Barsana’s chief and like king, Radha is his daughter. Gopadevi says king’s daughter is princess. Vrishbhan asks what they will do. Gopadevi says Baldevi will help in kitchen and knows to prepare tasty dishes. Baldevi/Balram thinks he knows only to eat tasty food and not cook. Gopadevi via telepathy says Baldevi can manage. Radha asks what will Gopadevi do. Gopadevi says she can do mesmerizing makeup with love as love can make people beautiful. Vrishbhan says then she will do Radha’s makeup and if everyone likes it, he will let Gopadevi stay in Barsana forever. Radha enters her room after bathe clearing her hair. Gopadevi stands near door. Radha asks to come in. Gopadevi says Ayan told she is princess, how can she enter her room without her permission. Radha asks again to come in. Gopadevi ask if she can. Radha says yes. Gopadevi walks in and looks at room carefully. Radha asks what is she looking at. Gopadevi says checking room to find appropriate place for mkeup, each place is mesmerizing. Radha sits in front of mirror and asks to do make up here. Gopadevi braids her hair and says she has curly tress, that means she loves someone. Radha angrily says she does not love anyone. Gopadevi asks how can it be. Radha asks to do her work. 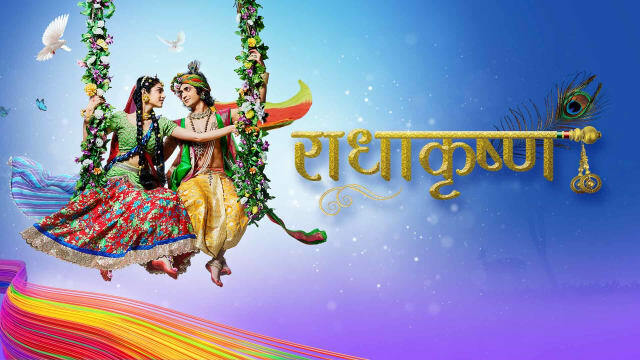 Gopadevi continues trying to make Radha confess her love for Krishna and thinks he will not let Radha’s marriage with Vyomesh happen. Krishna gives moral gyaan that human has an unique nature of evaluating things, one that is bought with more money is costly and with less money is cheap. He shows gold coin and water glass and asks which one is costly, definitely gold coin, but when they are thirsty, they can spend any amount for a drop of water; so one that comes handy in need is most precious. Precap: Gopadevi thinks without smile, makeup is incomplete. Kans’s aide via telepathy orders Jatila, Ayan, and Vyomesh to get Radha to Mathura tomorrow at any cost. They turn and get tensed seeing Gopadevi behind them.